Shotgun light offers a great advantage to you if you need to use your weapon in conditions where you do not have enough light to be able to accurately identify and aim at your target. There are a few things you will need to take into consideration before you choose a shotgun light. The weapon you intend to use the light on is the first thing you need to consider. You can use weapon lights on different types of weapons, such as shotguns, pistols or assault rifles. The weapon type could have a big impact on how the light is attached to the weapon. Some weapon lights are specifically designed for specific weapons, such as lights specifically designed to attach to a pistol barrel or a rifle barrel, however, most shotgun lights can be attached to a variety of weapon lights by using Picatinny or Weaver rail mounts. 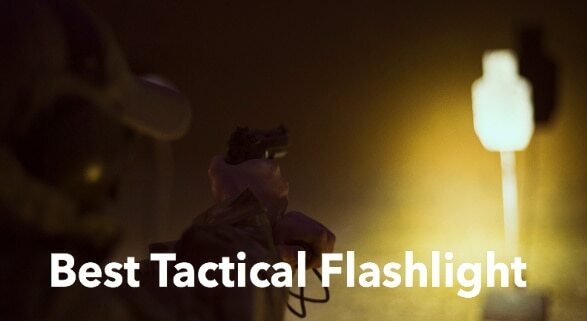 When using your light in a tactical situation, you will want to be able to control your light easily and quickly. For that reason, you will want a light that has a remote on/off switch system that you do not need to fumble with and can control with little effort. Typically a shotgun light should have beam focusing options, in order to switch between a focused beam or a wide beam. With a focused beam you can shine the light much further and brighter, while a wide beam covers a broader area. A good light should also have a bright enough beam that can temporarily blind a possible attacker. The indicator of how bright a light, is to look at the lumens specified for the light. The top tactical flashlights tend to produce approximately 500 lumens. The weapon lights below are the top-rated lights based on the average rating and comments from hundreds of users who have bought and used these weapon lights. 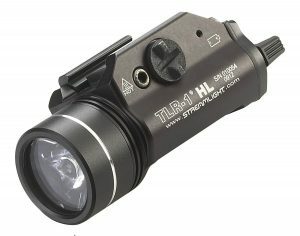 The Streamlight 69260 TLR-1 HL Rail-Mounted Tactical Light is a compact and lightweight flashlight that fits easily on many different firearms, but it may be the best tactical flashlight choice for those with handguns due to its small size and weight. This particular light is made of anodized aircraft aluminum, which allows it to be both light-weight and very durable. 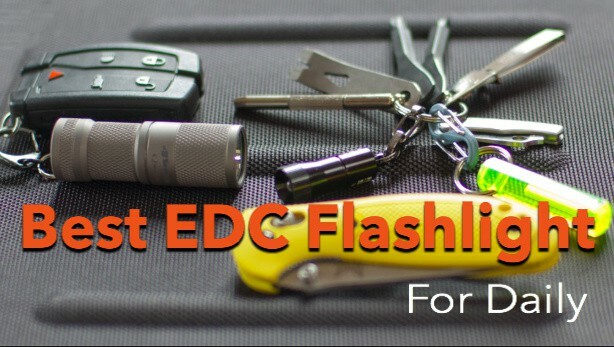 This tactical flashlight is praised for its extremely high brightness, allowing it to easily cut through even the harshest of darkness in emergency situations. This brightness is achieved through the use of numerous powerful LED lights that deliver 630 lumens of light, which is more than bright enough to blind or stun enemies if needed. Traditional batteries are the power source of choice for the Streamlight 69260, and the average battery life is about an hour and 15 minutes of continuous use. While there are many benefits to this light, you should always keep the negatives in mind when searching for the best tactical flashlight. The most common complaint is that, despite the fact that LED lights run cooler than incandescent bulbs, the light gets incredibly hot when active for more than a few minutes. The heat is also not contained the glass or front of the light. The entire unit heats up extremely quickly. This may not seem like a major problem since the light is not meant to be hand-held, but users could end up burning their hands while operating the light, and it could possibly melt certain items if the light is too close. 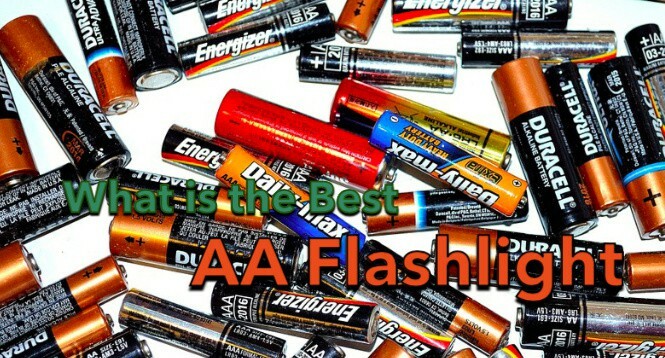 The light also has no brightness setting to save on battery life or to allow the light to run at a cooler temperature. However, it does have an additional strobe light setting for tactical purposes. 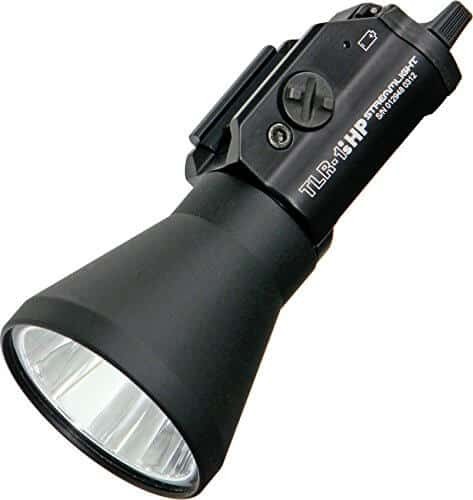 The UTG Combat 26mm IRB LED Flashlight is one of the more affordable flashlights on our list. It comes with a remote pressure switch, which makes it ideal for use on tactical rifles. As expected from a quality tactical light, this flashlight is made from aircraft grade aluminum with an anodized black matte finish. The mounting bracket has a quick release lever to make removing the flashlight quick and efficient. 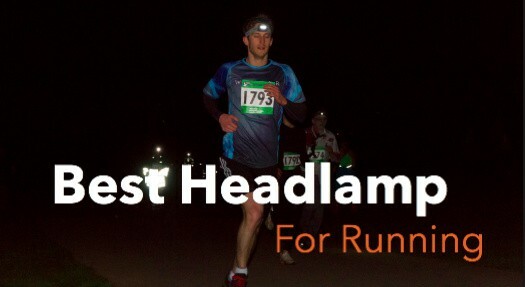 It is not the brightest flashlight, with a light that produces only 150 lumens. However, feedback from users who have used this flashlight indicates that despite the low lumens the beam is still very bright and has good beam distance. 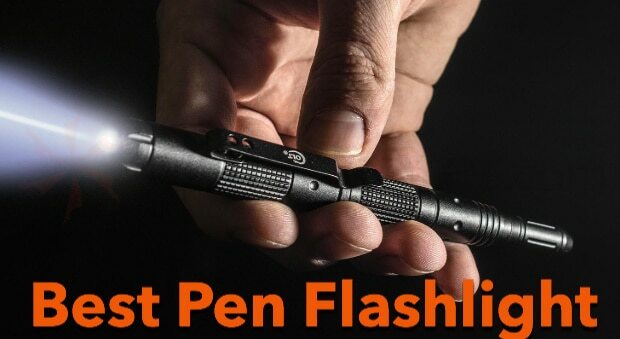 If you have to use this in close quarters, you do not need a super bright flashlight anyway. If you are in a shooting position with your gun, this flashlight allows you to switch the light on and off using a remote pressure switch without going out of your shooting position. 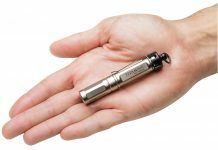 The remote pressure switch allows you to switch on the flashlight by simply applying pressure to the switch. If you let go of the switch the light goes off. You can of course, keep the light on by using the standard on/off switch. The is a good option if you want a flashlight that is not too expensive and plan to use it on a rifle. The Streamlight 69215 Rail-Mounted Tactical Flashlight appears to be a favorite among people who are looking for the best tactical flashlight for their firearms. 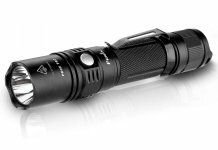 This flashlight is made from aircraft grade aluminum with a durable and appealing black anodized coating. In addition, the lens has also been specially crafted with incredibly durable polycarbonate with an additional scratch-resistant coating. The LED bulbs produce a modest 200-lumen beam of light, but the beam extends more than 400 meters and is still just enough to blind an attacker if necessary. 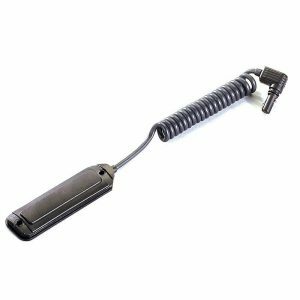 The Streamlight 69215 also easily attaches and detaches for quick and easy switching between guns, and it is compact and light enough to fit various types of firearms. Despite the fairly low lumen level, this light may not the best tactical flashlight choice for anyone looking to save on battery life. Even with an output of 200 lumens, the battery life has an average span of two and a half hours with a continuous running life of an hour and 45 minutes. The light also does not have any other brightness setting beside the default setting. 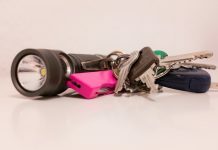 The light does include a strobe option, but some users have stated that it’s overly complicated to turn the strobe on, which could hinder any user greatly in an emergency situation. In addition, the switch to turn on the strobe and the regular light has been noted as being very sensitive and may trigger when lightly bumped. The best shotgun lights are the subjective matter. A lot of people will have different opinions on which weapon lights are the best, as everyone has preferences and needs. If you have an opinion on weapon lights, please share it with us in the comments section. Thanks , I have just been looking for information about this subject for ages and yours is the best I’ve discovered so far. But, what about the conclusion? Are you sure about the source? Ahaa, its pleasant dialogue about this article here at this blog, I have read all that, so now me also commenting here.